Timeline for Ellen Nora Payne (nee Field), 1865 to 1899 • Who was Nellie Payne? 1865 7th January – Ellen Nora Field was born at home at ‘Westfield’ Westbury Tasmania, the eighth daughter and twelfth of fourteen children to Thomas William Field and Elizabeth Isadora (née Lindsay). Nellie is later described as a child as having ‘delicate’ physical condition, fair-haired and large blue eyes. 1869 DB161 – Needlework by Nellie’s sister. 1878 Nellie attends boarding school run by Misses Garrett (Ladies Grammar School – Davey Street Hobart). 1881 Nellie is removed from school due to extreme homesickness. Nellie’s father, Thomas William Field, dies- Nellie was just 16. 1885 Dr Charles Payne accepts the locum position for the District of Westbury, replacing the vacationing Dr Allnutt, for a contract period of two years. 12th August Nellie attends the Deloraine Fancy Dress Ball as Undine, a sea nymph. 23rd January Nellie becomes engaged to Dr Charles Alexander Payne. 24th December Nellie receives ‘set of dish covers’ and ‘handsome walnut case containing silver cutlery – from the St Andrew’s Church Westbury congregation as a gift. 6 January Nellie and Dr Payne marry at the St Andrew’s Church, Westbury. Her bridesmaids were her sister Ethel Field and Miss True Wright (who later becomes a woodcarver) and four flowergirls. Charles’ best man was William Buckland and groomsman was Richard Field, Nellie’s brother. The reception was held at the Field family estate “Westfield”. The couple travelled by train, via Evandale, to Hobart for their honeymoon. The newly-weds made their home in Liverpool St, Hobart. 24 January Nellie gives birth to their first child, a girl, Madge Winifred. Nellie attends Fancy Dress Ball (Hobart General Hospital) as Mary Queen of Scots. 28th November Nellie holds stall No 4 at St Andrews Church Bazaar at the Library Hall in aid of the Anglican Church’s Chancel Fund . 16 November Nellie gives birth to their first son, Geoffrey Charles Payne. 1892 The family moves to 372 Church Street, Richmond in Melbourne, where Dr Payne sets up a medical practice. Melbourne friends – Dr Lalor and Mr and Mrs Henty and his sister Miss Henty. Nellie takes art lessons from Robert Wilheim Prenzel, a noted woodcarver. 16th June Dr Payne is given an inscribed carriage clock presented by St John Ambulance, Melbourne for lectures given by him. Nellie is presented with a silver toast rack. Nellie meets and befriends Baron Frederick von Mueller, the designer of Melbourne Botanical Gardens, at Government House Ball. 1896 Nellie gives birth to a second son, Alan Field Payne, at their Church Street home. His godmother is Miss Henty. 25th November Nellie attends Mrs P J O’Connor’s function (Mayoress of Richmond). 7th July Nellie attends Richmond Mayoral Ball. 25th August Nellie attends Richmond Return Ball. 1898 DB142 – Side board carved by Nellie. 1899 The family travels to UK, on P and O liner Arcadia, to visit Dr Payne’s family. It is a six week voyage. Dr Payne becomes the Chief Private Physician to the Duke of Tek- Queen Mary’s father. He has a staff of two junior doctors and three male attendants and lives in the Royal residence, the White Lodge, Richmond Park, London. DB10 – Nellie’s aunt Sarah Lindsay dies. 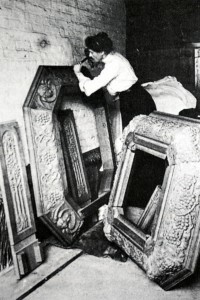 Nellie carves a memorial plaque which hangs in St Andrew’s Church, Westbury. Nellie enrolled at the School of Art, Goldsmiths’ College University of London UK – obtaining a Diploma of Woodcarving. Their UK friends are Sir Robert (Agent-General for NSW in London) and Lady Muirhead Collins whom they met on board ship to UK.